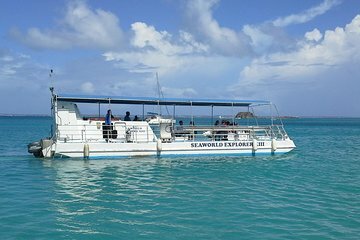 Board a semi-submersible vessel, the Seaworld Explorer, for a 60-minute tour of St Martin's underwater seascape. At Rocher de Creole, watch a diver enter the water and feed hundreds of tropical fish right outside the windows of the comfortable underwater observatory. This outing is family-friendly and allows people of all abilities to enjoy spectacular view of the Caribbean's sea life without getting wet. Listen to your naturalist guide as they narrate your experience, pointing out all the different types of abundant marine life. Board the Seaworld Explorer in Grand Case. Find a spot on the deck of the boat, or make your way down to the submerged underwater observatory. En route to Rocher de Creole, listen to entertaining commentary from your guide about the underwater environment of St Martin and its inhabitants. When you arrive at the reef, a diver will enter the water and hand-feed large schools of fish to draw them towards the viewing windows. Keep an eye out for eels, barracudas, stingrays and sea turtles. Be sure to keep your camera on hand for some special photos to take home. The Seaworld Explorer will continue on to a cruise down the coast of the island. Head up above board to relax in the sun and enjoy the scenery, including views across the channel to Anguilla. Return to Grand Case at the end of your Seaworld Explorer excursion.